Over the past few weeks I have been searching through the digitised Barnsley Chronicle at Barnsley Archives for mentions of war memorials after the First World War. I have been asked to present a talk to the Friends of Barnsley Archives in November next year and given that I had already spoken to them about First World War Soldiers I thought a suitable topic would be the War Memorials of Barnsley. In the Barnsley Chronicle in February 1919 memorial windows were suggested for St Paul's church at Monk Bretton and at Smithies and Old Mill along with brass tablets inside the buildings and stone tablets outside. Two weeks later a letter to the Chronicle condemned this plan as a waste of money and suggested building houses instead and the debate continued through into March. It was suggested that photographs of the fallen men with their names and honours attached should be hung in Smithies Wesleyan Reform Chapel, Old Mill Chapel and Smithies Working Men's Club. 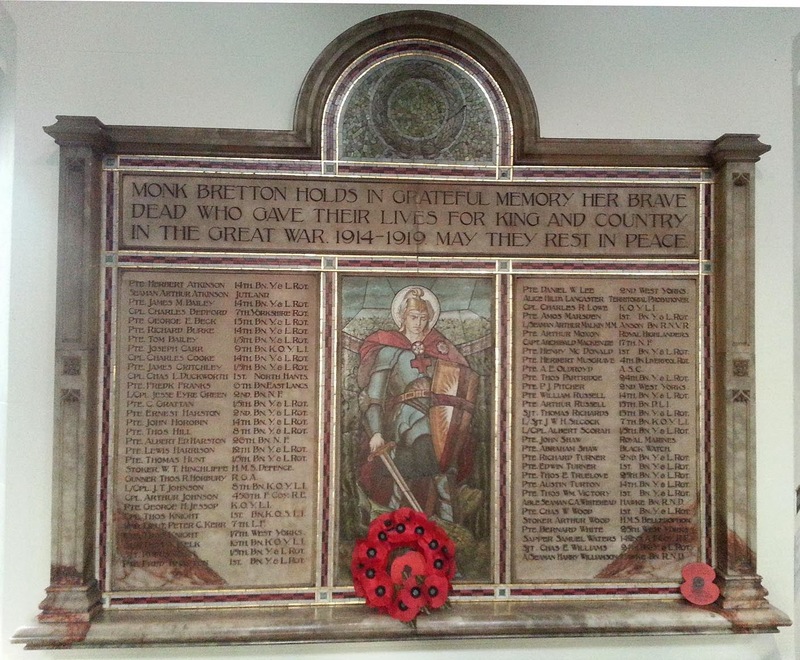 One correspondent noted that "90% of the men who have gone were Non-Conformists" and objected to the sole memorial being in Monk Bretton Church. In September 1919 an appeal appeared in the paper for names to be submitted for the memorial and then I note nothing more until a plaque is unveiled in June 1920 at Cliffe Bridge Wesleyan Chapel and then in March 1921 a Roll of Honour unveiled in Monk Bretton Working Men's Club. I wonder what was actually decided upon for Smithies and Old Mill? Forty-nine names are mentioned in the newspaper article (left) printed in the Barnsley Chronicle on 26 March 1921. These were not just the seven who fell, but all members of Monk Bretton Working Men's Club who served. A list of the names can be seen here and on the Barnsley War Memorials Project. I don't know if this Roll of Honour still exists - can anyone help me? The memorial in St Paul's Monk Bretton was unveiled on 22nd May 1921. It took the form of an large alabaster tablet with the figure of St George in the centre and the names of 61 one men and one woman were inscribed to either side. It was placed on the wall of the north aisle, where the OH and I were very pleased to see it yesterday afternoon. I spoke to the Vicar, Father Kevin Maddy, and asked if he knew of anyone who was already researching the names on the memorial. He wasn't aware of anyone so I offered my services. I have already researched one name, that of John Thomas Johnson who is a relative by marriage of the OH. His story can be found in one of my previous posts. 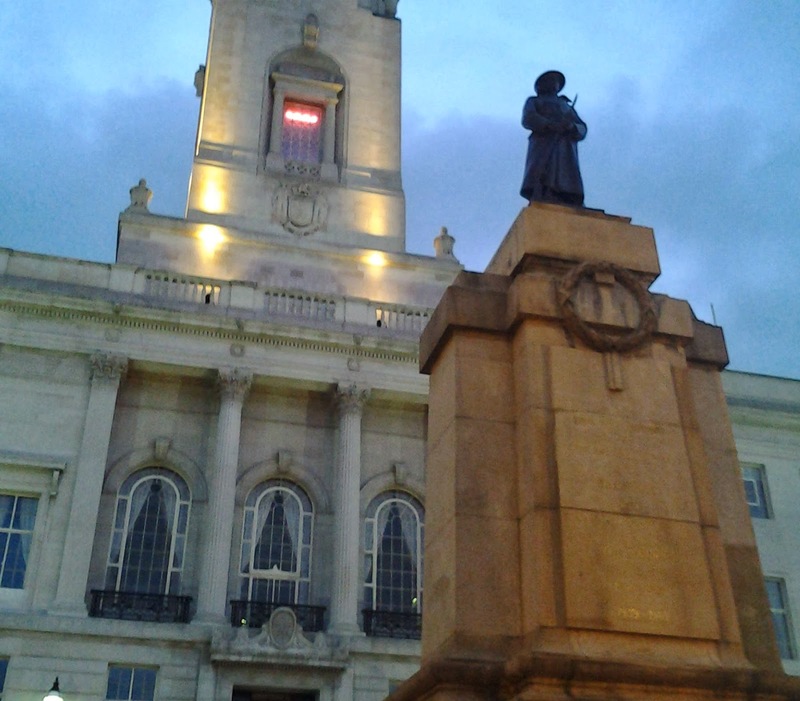 A transcription of the names can be found here and on the Barnsley War Memorials Project. 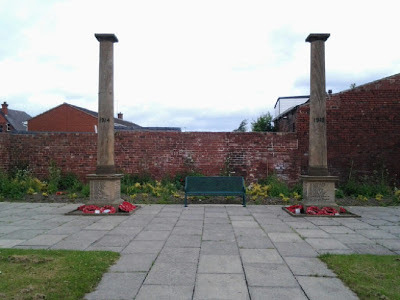 You might be wondering when I going to mention the War Memorial I visited some months ago on Cross Street, Monk Bretton. Well, it hasn't come up in the newspapers yet. Unhappily this means that the information for this memorial on the Imperial War Museum's War Memorials Archive is incorrect as it notes the unveiling of this memorial to be 22 May 1921, which I have just discovered is the date of the unveiling of the memorial in the church. I am sure that if this memorial was dedicated at the same time some mention would have been made in the newspapers, so I can only assume I must keep looking. The memorial lists casualties from both World Wars, however the dates 1914 and 1918 are carved into each pillar, suggesting it was originally erected to commemorate the First World War. The names on this memorial can be found on the Barnsley War Memorials Project. I suppose that's what I like about all of my family and local history research, it often seems that no sooner have you solved one mystery than another appears. When I find the answer I'll let you know!